For patients and physicians who want the highest quality of care and equipment Midtown Medical Imaging now offers the most powerful MRI (magnetic resonance imaging) test available on an outpatient basis: the extra-large (70 cm) open bore 3T MRI, the Siemens Verio. With the strongest magnet field strength used clinically, the Verio can be used for many applications, including neurology and functional neuro evaluation, orthopedic and cartilage assessment, breast, vascular, and cardiac imaging. 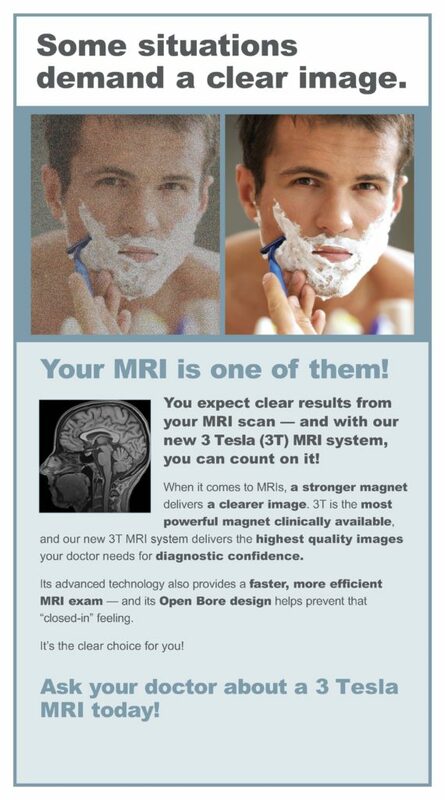 Midtown Medical Imaging is currently the only imaging center in the region to offer this advanced diagnostic system. In the past, the 3T MRI’s capabilities were only possible at academic research centers, but are now available in an outpatient setting. With a three to four fold higher signal-to-noise ratio than 1.5T scanners, 3T MRI studies of the knees, shoulders, ankles, wrists, joints and spines are clearer, more detailed and take much less time than 1.5T studies. Superior neurological imaging shows anatomic details that have not been seen before, such as concussions, other cognitive impairment and magnitude of scarring showing extent of damage to multiple sclerosis patients. Improved MRI abdominal imaging studies including hepatic, renal cancer, cancer staging and female pelvis/gynecology imaging. 3T imaging shows the effectiveness of rheumatoid arthritis medications in reducing inflammation and slowing joint damage. Large 70 cm bore (almost 20% larger than most MRIs) greatly reduces claustrophobia in patients. Large enough to fit 3 to 4 average sized people inside of it.